$619.99 to $699.99 & FREE Shipping on orders over $59 $35. 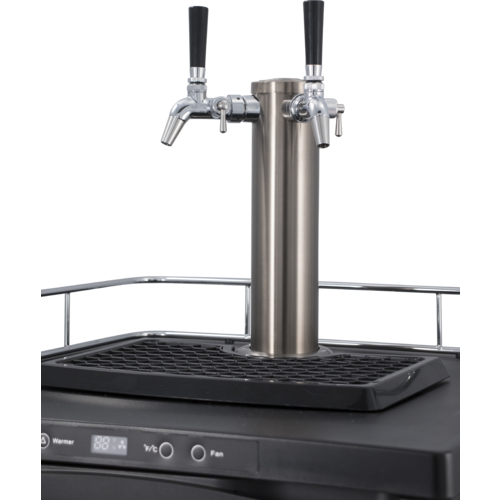 This kegerator with flow-control stainless steel Intertap faucets and stainless steel tower is an amazing value. 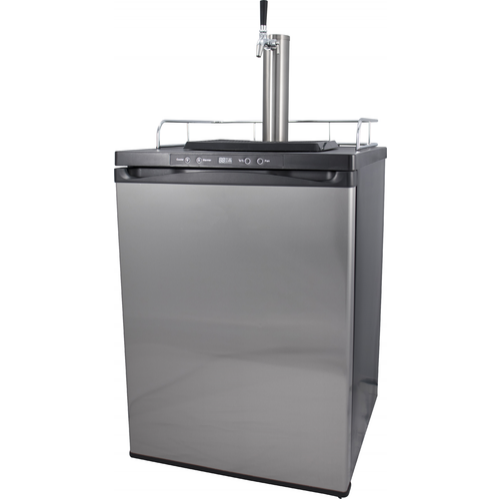 It features a digital controller, stainless steel door, stainless steel floor, rolling casters, tower cooling fan, glass rack, robust MKIII regulator, and more. 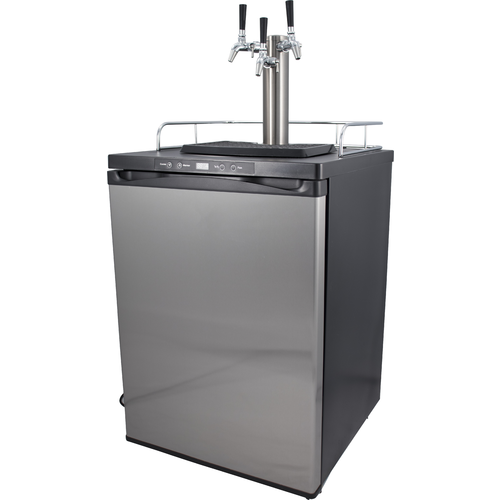 The Series 4 Kegerator is tailored to a homebrewer's needs. Take, for example, the extended range digital controller that can adjust internal temperatures from 26 - 82°F. 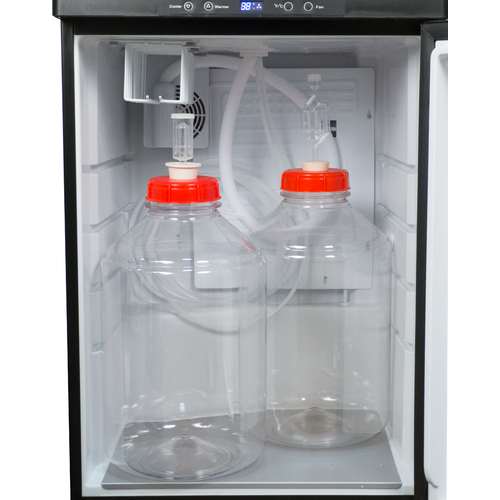 This allows homebrewers to use it for fermentation and is something that other kegerators don't do. 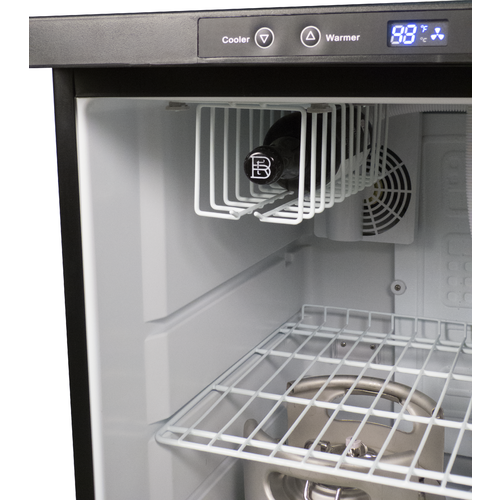 The digital controller always displays the temperature and is easily adjusted from the front of the kegerator with the door closed. It's pretty cool. 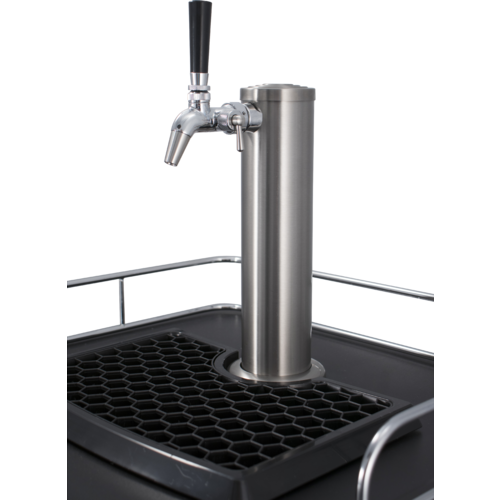 All kegerators come with Intertap faucets mounted on a stainless tower. These faucets are the newest, most advanced, forward sealing, beer faucets on the market today and will work perfectly for years. This model includes the flow control version of the all stainless faucet. Maybe the flow control on a kegerator is a little overkill but then maybe, just maybe, having a kegerator at all might be overkill. We know how you roll. The flow controls can be awesome when you have overcarbonated beer or generally want to perfect your pour. 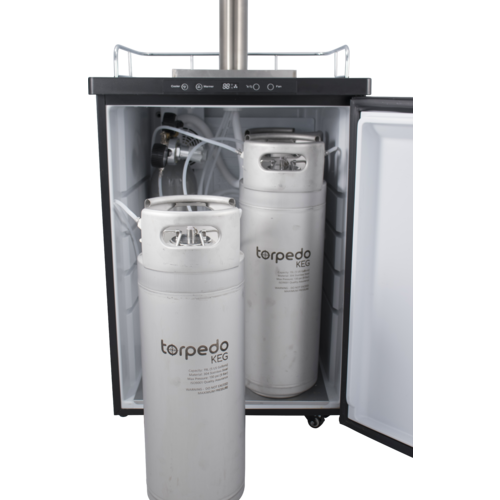 One of the unique features on a kegerator in this price range is the tower fan which blows cold air up into your tower to reduce foaming issues. They also come standard with the MKIII CO2 regulator, which is super beefy and consistent in delivering accurate pressures. Most Chinese made regulators experience creep where the pressure increases over time. The MKIII is by far the best CO2 regulator we have seen made in China. The stainless floor is a nice touch as is the glass rack which holds pint glasses horizontally or Belgian style tulip glasses up side down by the stem. 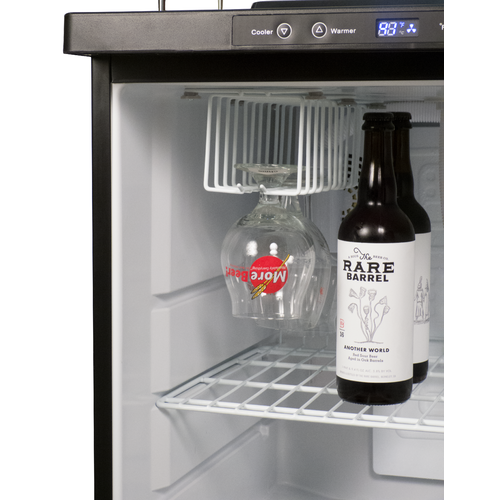 We show tulip glasses in the picture, but a pint glass (or 22 oz beer bottle) will slide horizontally into the rack. Way cool. 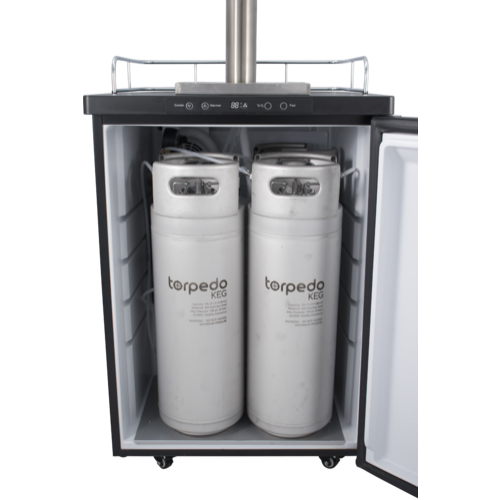 We've looked on the interwebs, and when you factor in fast and free shipping, you are getting the very best value on a kegerator in the USA. Plus you're getting MoreBeer! service if something happens in shipment. We double box the unit with foam pads and have very little shipping damage. However, it will be delivered via Fed-Ex ground so damage is possible. If your unit arrives damaged just call us up and we will work with you to take care of it. 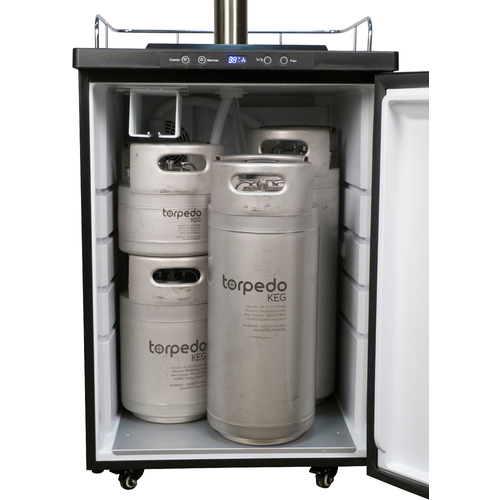 Available kegerator covers and "off road" casters for moving over uneven terrain. Click here for the Kegerator Instruction Manual. 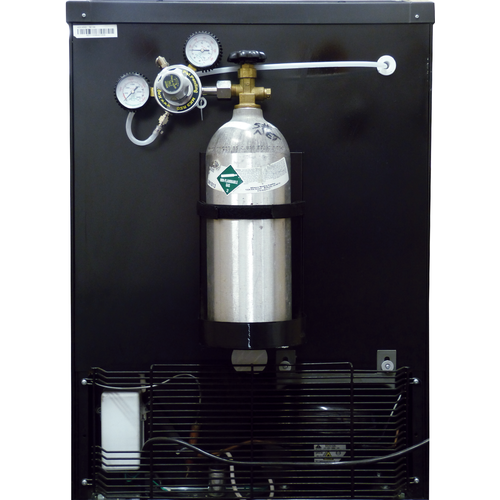 CO2 Tank (Aluminum) - 5 lb. 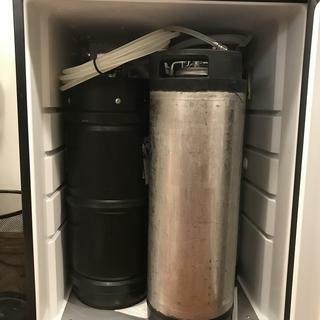 Needed a kegerator for home brewing that can be used as a fermentation chamber. The price and reviews on the item are awesome! Similar in price (or less than) similar options. Superior faucets. Can't pass it up. Good price on a dual tap. I brew all grain batches and I keg. This is much more convenient. I also want temp controlled fermentation. I bought one a couple months ago, and I really like this unit, so i'm buying one as a gift for my son! Digital Temp control for fermentation. 3 taps, and digital control, with flow control. Better price than anywhere else. This unit has all the features I want, including flow control faucets at a great price. What is the length and diameter of the beer & gas lines provided? BEST ANSWER: The included tubing is 5 mm inner diameter and 8 mm outer diameter. 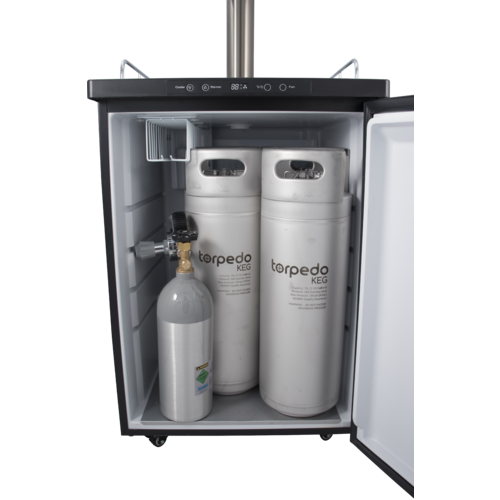 Each kegerator will come with a 3 foot length for gas and a 12 foot length for liquid. 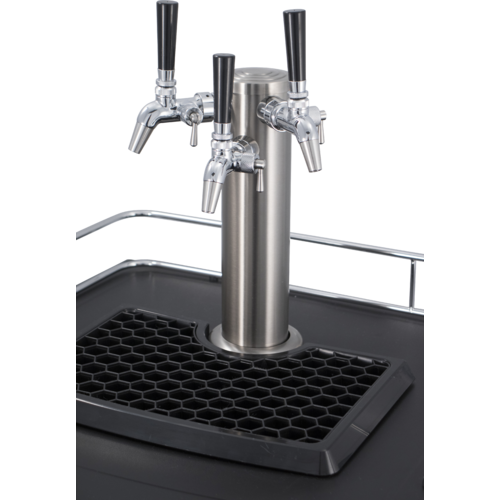 If you choose the double or triple tap option, you will receive as many lengths of liquid tubing as taps you select. The length was about 13 feet and the diameter 1/4 inch. Length of gas line I didn`t measure but was suffient. Literature says the thermostat controls the temperature from 26-82F. Does that imply there is a heating element to raise the temp if the ambient temp is say 68F and you want to use it for fermentation for a Saison and 75F? BEST ANSWER: This item does not come with a heating element, you can purchase a dual stage digital controller and add a heating element if you needed to raise temps inside for fermentation. So what is the point of advertising that the supplied temp control can be set as high as 82F and used for fermentation if it is not dual-stage? 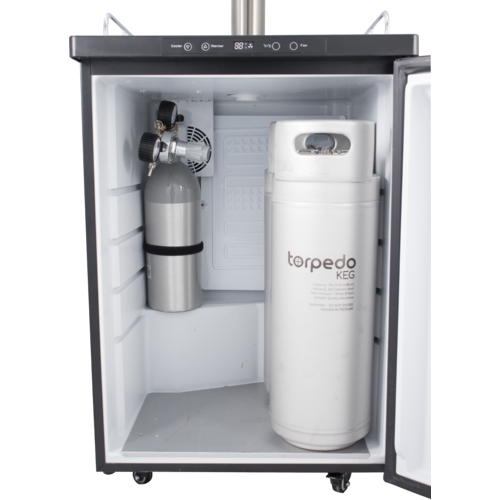 Would this be able to fit three 5 gallon ball lock kegs, as well as a 3 way secondary regulator and all the gas and beer lines inside the fridge? BEST ANSWER: Yes you can. I currently use a 3-way regulator, two 12' and one 22' lengths of beer line, and about 3-4' of gas line for each keg. The regulator I have zip-tied on the shelf in the back-left corner. There is enough room for all this kit, two ball-lock kegs, and one commercial sanky keg. Three ball lock kegs would have even more room. The gas bottle and primary regulator definitely need to be on the outside of the kegerator in this configuration though! Would you be able to share images of what your internal set up looks like? I wasn't able to post pictures in this section, so I left a review including pictures of my setup. Been working great so far! Not everything in the pictures is included with the kegerator, of course, but everything but the kegs was purchased from MoreBeer! It would be extremly crowded with three kegs. I have two kegs witha manifold mounted at upper left top so I can hook both kegs to regulator on back of kegerator. With gas and beer lines it is somewhat crowded. Have to switch beer line when tapping other keg. 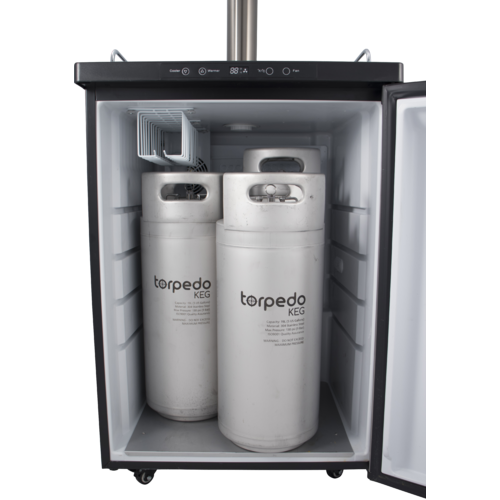 The kegerator will fit three 5 gallon ball lock kegs. The regulator should fit toward the back of the interior space. The difficult, but doable, part will be managing the three sets of gas and beer lines. No, not in my opinion. I have two ball locks and a secondary regulator in mine. This leaves enough room for a six pack. Yes. This is my exact setup with a large 3-way regulator inside. It is tight but easily doable. Thanks! Would you be able to share pictures of the inside when you have time? Yes. That's what I have. CO2 tank strapped to the back. Yes it will that is how I have it set up. Thanks! would you mind sharing a picture of the inside of your set up when you have a chance? How hard is it to replace the beer lines? I'm not a fan of the hard plastic lines. BEST ANSWER: Should be pretty easy. You would need new lines and clamps. However diameter and tubing length would need to be calculated so as to avoid foamy pours. The kegerator comes with some guidance on how long your beer lines should be. CO2 line length does not matter as much as long as it reaches where you are keeping your tank. Kegerator comes without lines connected. The intent is for you to cut to length and assemble from a coil of tubing. The hardest part is working inside the tower. If you have one or two taps it's easier. super easy some hot water and a pair of needle-nose pliers to stretch makes everything go on easy. If you cut the cut them off it's super simple obviously. I've had mine for a year-and-a-half no issues! Not hard at all. Ive installed PVC free beverage tubing without issue. Tower is a bit tight so consider getting correctly sized oetiker clamps and just crimp on. Not hard at all. Use hot water to soften the plastic. Then use a cap to a bic pen to expand the hose and slide it on. I'm with you. I replaced mine with more standard beer lines like I have at the brewery. Not an issue to do. Is there a fitting to seal the gas line in the back of Kegerator? BEST ANSWER: there is a pass through connector that allows you to put the line in from the back to the inside. My unit came with a regulator and PVC tubing with an inside diameter just slightly under quarter inch. 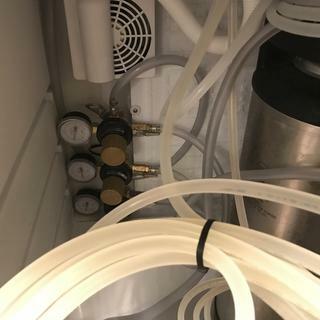 The gas line passes through a rubber grommet in the rear wall of the kegerator. Pretty much seals the cool air from leaking out. There is not a threaded bulkhead connector for the gas line. Mine has a treated cap. there is a hole for it I did not use mine I keep the gas inside, you should watch the keg king videos they will show you everything. mine came in perfect condition works good for me. 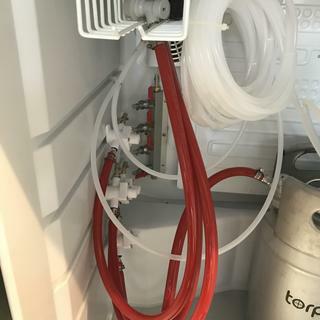 My gas line goes through a small port (hole) in the back of the kegerator and connects directly to the regulator. No, I wedged insulation around gas line and hole no issues its fine!! Is there a warranty provided on this unit? BEST ANSWER: Hi Justin - We do provide a one year warranty on most products including the mentioned item. More information regarding warranties can be found here: https://www.morebeer.com/content/return. 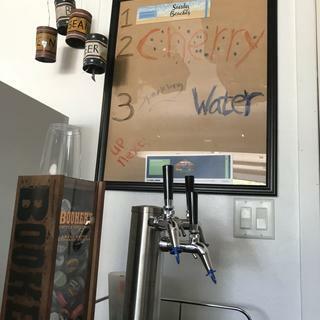 Does the MoreBeer Tap handle fit this 3 tap setup? BEST ANSWER: Hi Charles - Yes, the MoreBeer tap handle will fit the 3 tap kegerator. The depth with the CO2 on the back is kind of too deep for me. Can the mount be removed and the CO2 tank put inside? If so, is there any disadvantage other than not being able to hold 3 corny kegs (assuming 2 will still fit)? 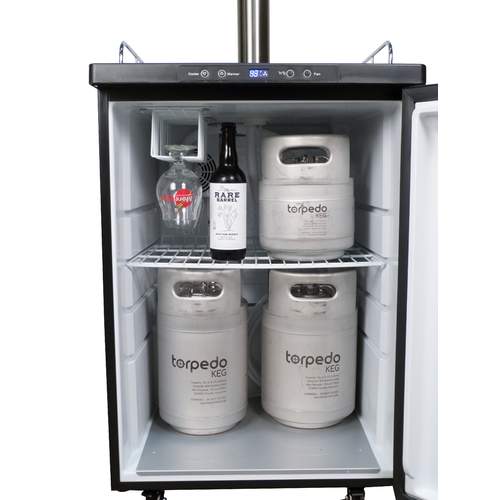 BEST ANSWER: Hello Michael - Yes, the tank can be fitted inside with the only disadvantage of one less keg. Are any casters included? The "Features" section states that "off-road" casters are available, but what comes with the base unit? BEST ANSWER: Base casters are included. Off-road casters are an upgrade accessory. I have the three tap version, and have had this unit for aproximately two months now. For the money I think this is the best unit out there. That said, there are a couple things worth noting. I had to play around with the insulation in the tower in order to get it to where it would not sweat with the fan running, which I keep on all the time. In relation to the fan, it is quiet enough that you CAN let it run non stop, and the current draw is so little that it is worth it to insure the beer in the tap lines stay cold in the tower. 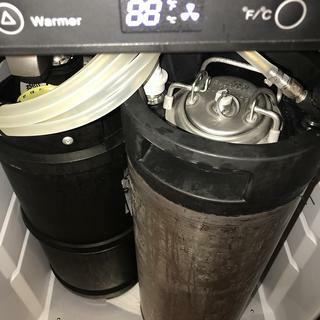 I am able (barely) to get three kegs in and set my CO2 bottle on the little shelf in the back left corner; I have to rotate the gauges facing the back though, which means you cannot read them: This is necessary to get everything inside. I did this because I did not want the unit sticking an extra 6-7 inches off the wall which it would if the CO2 bottle was strapped on the back of the unit. Now for the bad: Although upon assembly I had no leak issues, after about 6 weeks one of the air lines cracked and had to be repaired. the provided air/beverage lines are absolute GARBAGE! I used it despite reading other's comments about replacing them up front. I will be repacing them as soon as I have time, but it would have been easier to follow other reviewer's advice and replace them up front. In order to use the provided lines, it was necessary to heat them up enough to slide onto the barbs; I used a hair dryer for the purpose which worked well, although I would imagine the same thing could be achieved by sticking the ends in very hot water. One other thing worth mentioning is that after several weeks I started hearing a noise related to the tower cooling fan, after turning the unit off and sticking my hand back there, I discovered a piece of metal tape about 2" x 2" that had come loose and was being hit by the fan blades and creating the noise. After pulling it off, the fan returned to it's previous quiet noise level. Not sure what the tape was from, but it has not affected performance removing it. The PRIMARY reason I have given 4 stars instead of 5 stars is because of the beverage lines. Otherwise, I would have marked it a full 5 stars. Agin, after my research I concludedthis was the best unit for the money given the features, and in that regards I was not dissapointed. 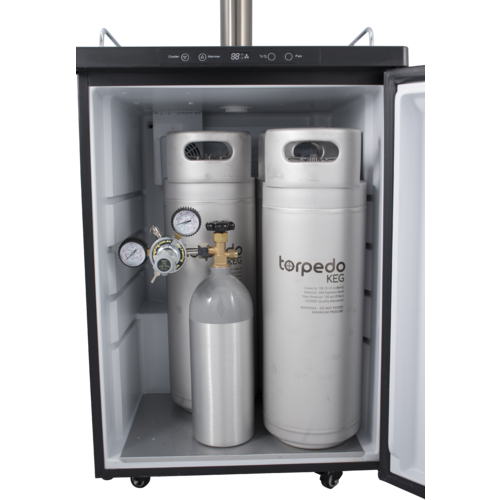 3 kegs and a CO2 bottle DO fit inside, albeit barely. Thank you so much for your feedback. Really good points regarding the kegerator kits that could potentially assist future customers. We really appreciate the honesty and value great feedback like this as it helps us improve our products. Cheers! Got the 3 tap model. Works really well once it was set up. Only real issue is it does not come with any kind of directions on how to set it up. I had to go searching online for a video and even then the series 4 seemed a bit different. They were using fittings to connect that did not come with the system. The plastic lines that come with it are very slim and extremely difficult to fit onto the connectors and taps. Even heating them with water to make them soft it was still very difficult. The clamps that come with it require a crimping tool that I was not able to find at the hardware store or even online. I had to use a pair of large pliers and crush the side. Once on they are impossible to remove. Had to use my Dremel tool to cut them off when making the tubing shorter. I think a more universal hose type clamp would work better. 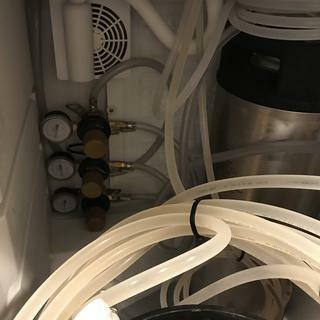 Putting the kegerator together could have been simpler and taken less time IF there were directions included and small hose clamps instead of the crimp clamps they use. Once everything was together and I got my keg in it chilled right down and my first brew was ready to drink the next day. Made the Pliny the Elder from here. Very good beer. Very happy with the unit so far. 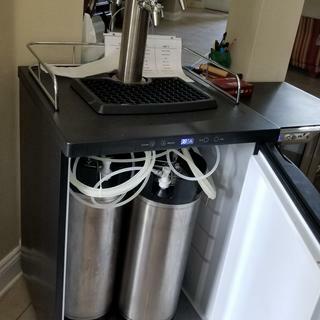 Only other gripe, which has nothing to do with the kegerator, is I wait and wait for a sale and finally just pull the trigger and buy, then a week later it is sold with a free keg. Missed out on the keg, oh well. I highly recommend this unit though despite the issues I had getting it together. For the price and what you get it is well worth every penny. 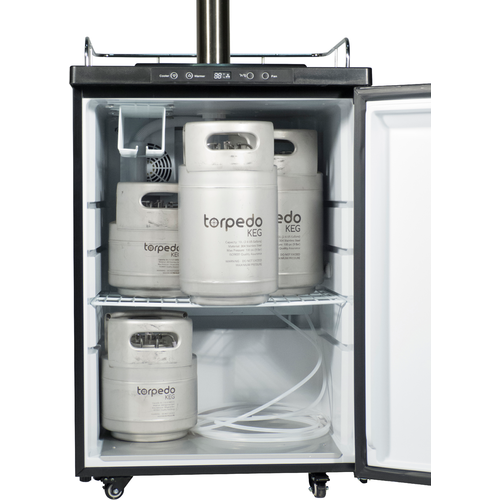 This Kegerator is a great product for a reasonable price. Very good quality. I make wine and brew beer, so the 2-tap model is ideal for me. One tap is for white wine and the other is for my current batch of beer. I do agree that the manuals are worthless and that you must watch the recommended videos. No problems with the tubing or the clamps, as long as you have the right tool to crimp them. The wheels work fine on my concrete floor, however I don't move the Kegerator around. Temperature seems to be consistent. My only difficulty is that I use Argon for my wine and need another external entrance for the Argon tubing. Bought for my husband, set up was challenging but it puts a smile on his face every time he pours a beer. It’s also VERY quiet. Well built I purchased the 3 tap flow control model. However! 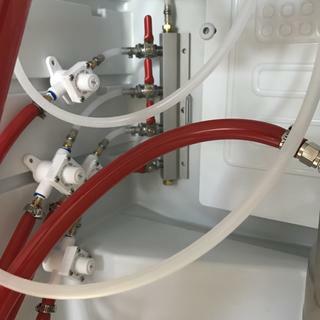 If you buy it throw away the beer and CO2 lines the beer line in particular is near impossible to fit without creating leaks due to overstretching of the tube. Buy some 3/16 ID beer line with a 7/16 OD and grab a pack of 7/16 Oticker clamps and a clamping tool. Have plumbed it all in 3/16 including CO2. Not too sure about the supplied regulator as the CO2 outlet connection does not contain any rubber gasket but is a metal to metal seal. I bought some O rings in case this leaks. Overall a great product. Good value for money. Don’t expect instant cooling with this unit. It took a LONG time to get to 34 degrees with about 40 12 oz beer bottles that were put in at room temperature. Of course with a keg at 5 gallons I would think this would take at least 12 hours to cool down to 34 degrees from room temp. Very pleased with this product so far. 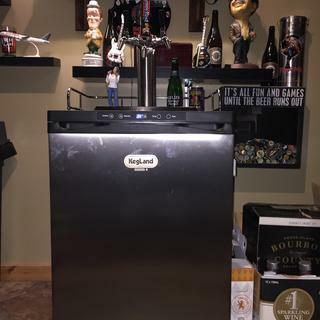 The Series 4 Kegerator arrived in good condition around the 1st week of November 2018. Didn't have any beer to tap so just hooked it up and plumbed it. I noted the regulator had a flare fitting (1/4") barb to the air line. I also noted the UHMWPE washer to tank hook-up. I've had problems with this hook-up before on the Fermentap regulator (which says in specs must use a fibre or plastic washer additionally when hooking up the CO2 bottle. I could never get the Fermentap to seal to the tank properly so I bought a Taprite and never had a sealing problem. All regulators were purchased from MoreBeer...been a customer since Olin and his brother started the business in Concord way back in the day. 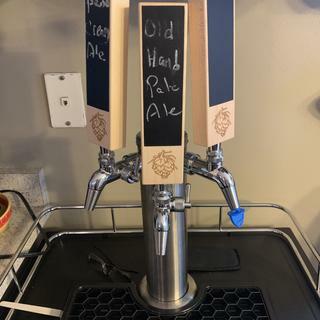 I have a 4-tap home-made kegerator in the garage and have been using it for 30 years. When I finally had some beer to tap I hooked it up (around 1 week ago. Found the system worked well, with the exception the MKIII regulator leaked like a sieve! So I called MB Customer Service and they were quick to send me a seal for the flare barb because it was metal to metal. After receiving the gasket seal I installed it and got it tight. Still leaked, so I eliminated the gasket and hooked the flare/barb up tighter. It appeared to not leak...(I use the tried and true Star San system of leak detection). But the connection to the CO2 bottle leaked a small amount...so I put a bit more muscle on the locking nut and it seemd to be fine. I poured many fine pints this last week...however I checked the low pressure gauge fo make sure all was fine and found the CO2 tank was empty!!! I just filled my CO2 bottle and had a full tank (5#'s in a 12# bottle) when I hooked it up last week! 2. 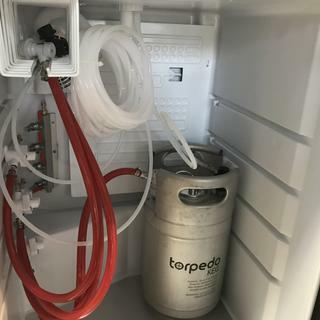 I feel the regulator that comes with this kegerator has issues and MoreBeer should replace it with a Taprite regulator...the one that works! Please advise at your earliest convenience to resolve this problem. I'm using one of my Taprites to save my beer. Hi Lee - Thank you very much for the informed and detailed feedback. Please give us a call at 1-800-600-0033 or email us at info@moreflavor.com so that we can assist you. We are here to help. Cheers! I bought the triple tap Kegerator with intertap Faucets and am not impressed with at all. I have twice had to reinstall all the hoses because they split at the cheesy barbs they include with the installation package. One time I lost a gallon or 2 of beer all over the inside of the keg, and twice now I have lost all of my CO2 do to the lines splitting. First time was about 3 months after purchase second was a month or 2 later. The only reason I have given 2 stars is because both times Morebeer has replaced the hoses for me at no cost. I would not buy this product again and I actually am going to sell mine and purchase a different brand. If you do buy one the only thing I could see working is if you buy all new tubing and a manifold system WHICH IS NOT INCLUDED! Yes you can. I currently use a 3-way regulator, two 12' and one 22' lengths of beer line, and about 3-4' of gas line for each keg. The regulator I have zip-tied on the shelf in the back-left corner. There is enough room for all this kit, two ball-lock kegs, and one commercial sanky keg. Three ball lock kegs would have even more room. The gas bottle and primary regulator definitely need to be on the outside of the kegerator in this configuration though! The regulator is held in an upright position using a couple of zip ties holding the regulator (somewhat loosely) to the mounting tabs reserved for an inside-mounted CO2 cylinder. I didn't use the gas line supplied with the kegerator. The gas line I used required me to completely remove the plastic body fitting through the back of the kegerator. I didn't seal the hole around the gas line and have had no issues with it in 10 months now. Finally, you won't be able to use the glass rack with three kegs inside. Thank you for the great review Brian. The video helps for installation, but even then I found this wasn’t all that bad to get together. Hot water is key to getting the fittings on. Also, plan the layout and then double check that’s what you really want to do. In my case I added the 4 valve manifold with micro valves. The manifold fit well in the back where the CO2 tank could go inside the fridge. The hump helps protect the manifold. I mostly run 1.75 or 2.5g kegs, so I’m not worried about not being able to reach the manifold. I can stack 2 1.75g kegs with lots of space BUT there isn’t enough room for a shelf if you do this. 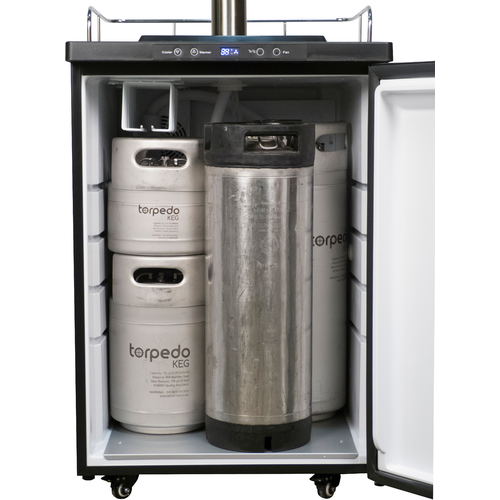 4 kegs just won’t fit on the floor, but after looking at how close it is I almost think a set of slim torpedo kegs will fit. I’d love for someone to try! I have my setup in the garage and it’s been HOT. I have it set for 42 degrees and most of the time it’s at that temp. Adding a small fan to blow on the back of the fridge really helps to keep the compressor a bit more cool and the temps down in the fridge. I picked this product because it had the features and complete accessories I wanted. I liked the focus on the home brewer for this product. Overall I like morebeer. They did an exceptional poor job with this order and customer service follow up. It would seem I was the lucky few who have a less than perfect experience with them so I won’t say people should run the other way. I will say you shouldn’t ask for delayed shipping as it will be forgotten. FEDEX will delay delivery if you ask them too, so go that rout. I did not need to be home to sign for the package, which I found rather odd at this price point. This may help answer questions you have about shipping that morebeer could not. I will agree with others that many items are loaded in the fridge for shipping from the other side of the planet. My shelf was damaged due to this but I’ll just live with it. The zip ties holding product to the shelf were way undersized and never had a chance with the forces applied on them. The damage isn’t bad but just don’t be shocked when you open the door and see a mess. It took a while and patience to set the unit up. It came with no instructions that were worthwhile. Instead they refer you to their YouTube videos. I personally like a good manual. Working the very stiff tubing was somewhat difficult. 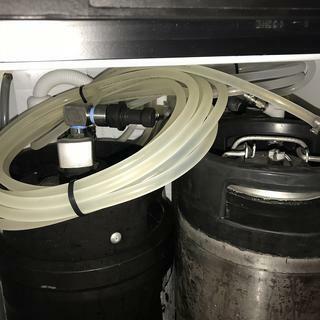 Also, because of the stiffness the tubing, it can put stress on the corny keg pin lock connector which could translate to leakage. Most of all, the Keg King is advertised as fitting three corny size kegs. I have tried and tried and rearranged and pushed, and cannot get the door to close completely with three kegs inside. I am holding the door closed right now with duct tape. Very disappointing in that respect. However, the SS flow control Intertap faucets are really nice. I highly recommend buying the wheel upgrade especially if one plans to move the unit around a lot. The wheels that come with the unit are really small and will not function well if the unit is fully loaded. pros. the flow controlled taps, the kegs stay at constant temp, the cooling fan for the tap tower all work great. Cons: connecting the beer and gas lines to the US ball connectors is much more difficult than shown on the video. wish: the Co2 bracket could mount the the side of the kegerator so the unit could align with my 26" deep back bar. Great item. Arrived packaged well with no damage. Directions kind of are a pain. However, with the YouTube videos and a little common sense I had it together in less than 20 minutes. Thank you for a great product! Arrived in perfect condition, free shipping is another advantage in buying from More Beer. Went together easily and is solid. Flow control taps are very nice. Would recommend to anyone. This thing is awesome, very well built, could use better instructions though (highly recommend watching the YouTube videos) So far extremely happy. Working as expected in our tasting room for hard cider. Would have been 5 stars but it is not as large as I expected. I have two corny's in it and it is full. Works good though. Tricks I found - if you cut a piece of the packaging you can use it to insulate the tower cap - the gas line in let can be removed by rotating it 90 degrees and pulling.